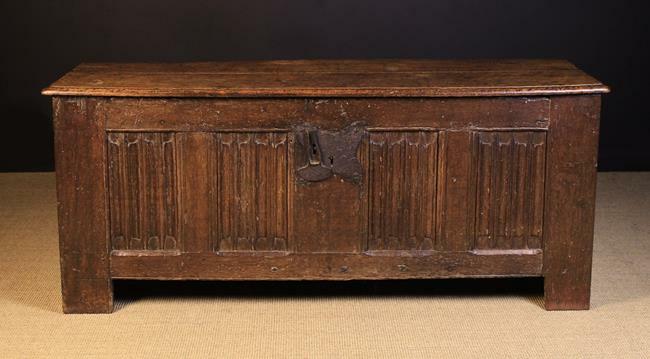 A Large Late 16th/Early 17th Century Oak Coffer having a four panelled lid and front: The front panels enriched with linen-fold carving and having a heart shaped iron escutcheon to the central muntin, standing on low stile feet, 25 in (64 cm) high, 54 in (137 cm) wide, 20¾ in (53 cm) deep. 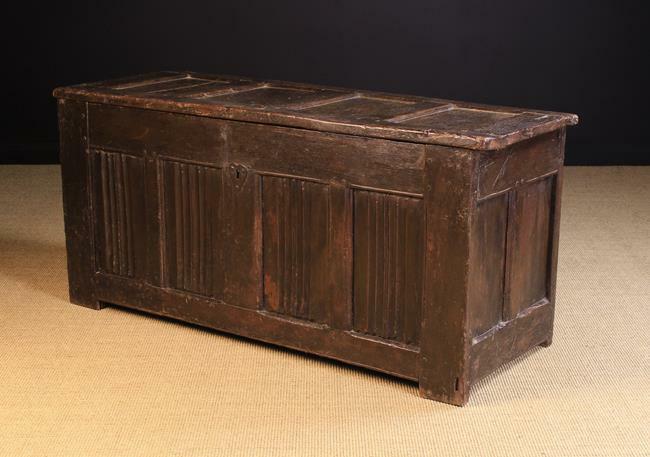 A 16th/Early 17th Century Flemish Joined Oak Four Panel Coffer. The front panels enriched with linenfold carving, standing on stile supports 27½ in (70 cm) high, 55½ in (141 cm) long, 22 in (56 cm) wide. A Late 17th Century Irish Wrought Iron Rushnip with cresset base. The rush jaw counterweighted by a candle cup on upswept arm. The centre stem leading down to a ring base with humped connecting bars. 12½ in (32 cm) high. 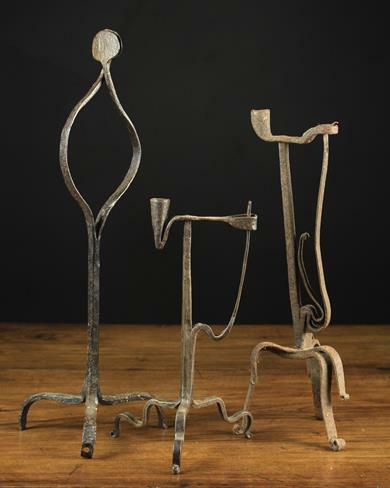 Three Wrought Iron Peermen. 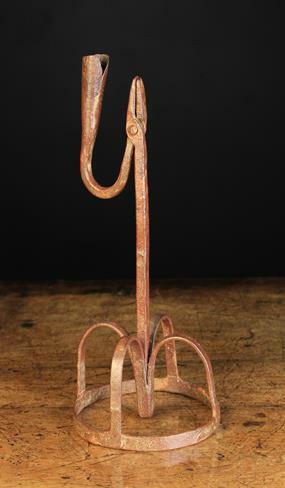 One 18th century with candle socket and sprung rush holder on a tripod base with scroll feet, 17¼ in (44 cm) in height. Another 18th century having wavy sprung strap jaws with pad ends on a tripod base 21¾ in (55 cm) in height. The third in the 18th century style with a conical candle socket and sprung rush holder on a tripod base with wavy legs and small scroll terminals, 13 in (33 cm) in height. 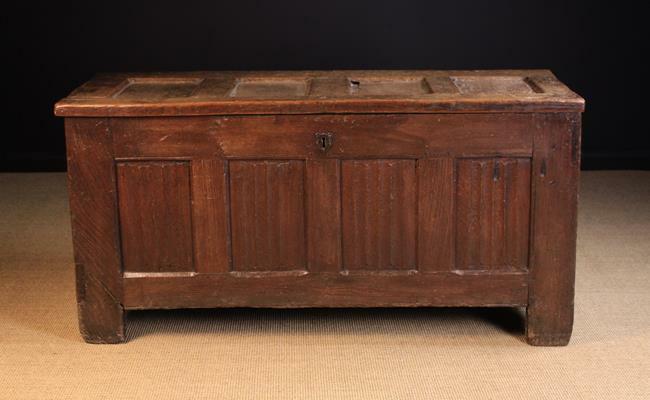 A Large 16th Century & Later Westphalian Oak Coffer. The moulded lid on iron strap hinges above twin panelled sides and a four panelled front enriched with linen fold carving and fitted with an iron faux lockplate to the broad central muntin. Standing on stiles 26½ in (67 cm) high, 62 in (158 cm) wide, 21 in (53 cm) deep. 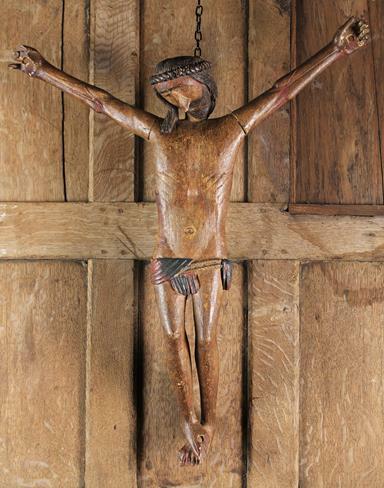 A Primitive 17th Century Spanish Polychromed Carved Wood Corpus Christi, 27 in (68.5 cm) in height. 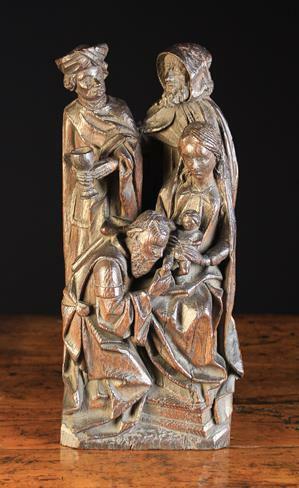 A 19th Century Oak Carving of The Adoration of the Magi, in the early 16th Century Style, 15 in (38 cm) in height. 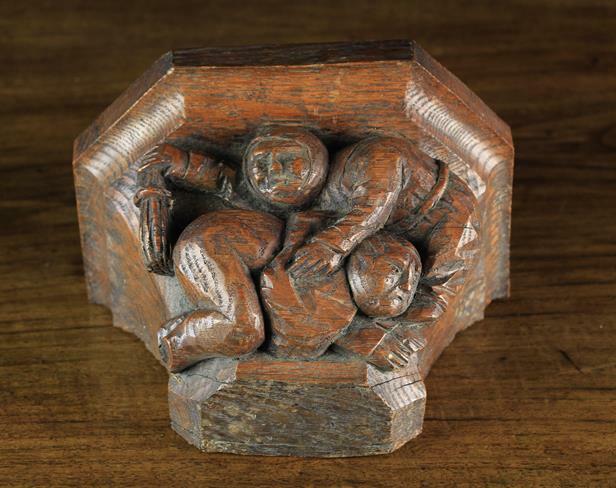 A 19th Century Medieval Style Carved Oak Corbel/ Misericord depicting a man spanking a bare bottomed figure below a canted ledge with moulded rim, 5 in (13 cm) high, 8 in (20 cm) wide, 5¼ in (13.5 cm) deep. 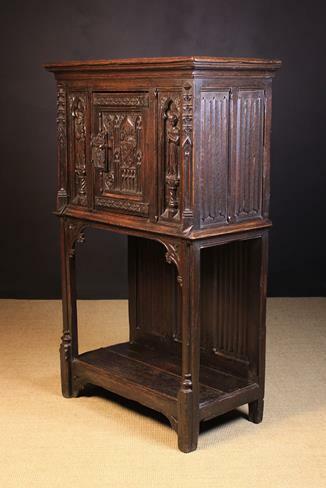 A 19th Century Carved Gothic Style Dressoir. The panel door enriched with tracery and having decoratively cast strap hinges, bolt and lock plate flanked by side panels depicting the figures of a man and wife on pedestals stood beneath trefoiled arches with crocketted pilaster appliqués either side. The cupboard raised on front supports and a linen fold panelled back leading down to a base shelf on bracket feet, 55½ in (141 cm) high, 35 in (89 cm) wide, 17½ in (44.5 cm) deep. 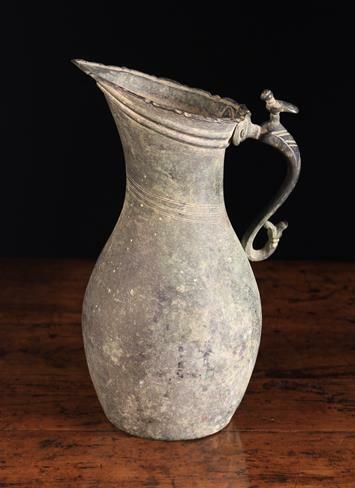 An Antique Iranian Copper Pitcher. The baluster body having an angled rim with crimped, folded edge above two embossed reeds and a band of incised decoration. The S-scroll handle surmounted by a bird finial and having a fish tail terminal. 13¾ in (35 cm) in height.